Testimonials: Simile keeps the doctor away, please face with cancer optimistically. NG TJAI HONG, 54 years old now, comes from Malaysia. As a housewife, she takes good care of her husband and children. However, a sudden bad news broke her happy life three years ago. Introduced by a relative, NG TJAI HONG started to drink a kind of liquid medicine, which was claimed to developed by a Singaporean professor. However, two and a half years passed, her tumor did not shrink but became much bigger, and the color turn into red. At that time, NG TJAI HONG was very confused, keep drinking the liquid medicine or go to see other doctors? Under the advice of her husband and sister, NG TJAI HONG finally decided to see a doctor who is specialized in traditional Chinese medicine. Her condition was so serious that the doctor only gave her medicine for one week. After taking the medicine, NG TJAI HONG’s condition turned better but the tumor on the left side of her neck started bleeding. She was so scared that did not know what to do, even prayed to Buddha for help. Her relatives and friends all helped look for a better ovarian cancer treatment for her. Sooner, her niece found Modern Cancer Hospital Guangzhou on the internet and told her to take treatment there. With the accompany of her families, NG TJAI HONG went to the Kuala Lumpur Office of MCHG to get detailed information about the treatment. 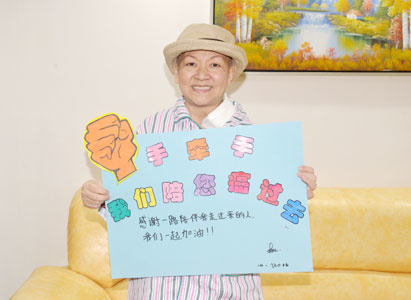 After consultation, NG TJAI HONG decided to take cancer treatment in China. NG TJAI HONG came to Modern Cancer Hospital Guangzhou on May, 2016. She was unable to speak when hospitalization, because the tumor pressed on her nerves. Considering her serious condition, the multidisciplinary team (MDT) of MCHG quickly made her a treatment plan: cryotherapy, interventional therapy and natural therapy.